Watch for frustration now -- it could make you say things that you can't take back. Are you growing so impatient with someone that you're just about to give them a piece of your mind? Take a deep breath and stop yourself. You'll have to watch out for frustration right now -- it could make you say things in the heat of the moment that you will really regret later. When your temper flares, there is no going back. Chances are, this person is completely unaware that you are upset right now, so it is up to you to let them know. Be clear and polite, and tell them what you need. Actually, the first time I heard about it was around 3 years ago when kak Shima asked if I wanted to go. I had a class that night and was a bit confused on why kak Shima wanted to go to a pasar malam (also confused why she said it in english instead of calling it pasar malam haha..) in Batu Feringghi. Turned out, it was a bargain heaven.. BUT, I never got to go.. until yesterday! We roped in Bart and decided to go there together. Luckily, Bart, though lived most of her life on the main land, her hometown was actually right here in the island so we had a tour guide that made it almost impossible to get lost finding the place. First we decided to meet at KBJ. Yeah, yeah.. I know, with QBay, KBJ orang dah tak pandang. But lets just say, for me and Misa, it has quite a sentimental value for us hehe.. Misa bought a new t-shirt as she was drenched on the way to meet us (me and Bart went into Penang together as I parked my car at her home) and then we went to Kenny Rogers, hoping to see Izati as my friend here know my sister.. but Izati wasn't working that night. Anyway, we spent a good hour doing more talking than eating before going to the musolla for Maghrib prayers then we headed off to Batu Feringghi. Bart turned out to be quite a coward on Penang roads haha.. but we arrived there very, very safe hahah..
Me and Misa agreed, if we were left to find the way ourselves, I would've just passed by this area. It wasn't as I had imagined but the goods sold there.. tsk! It was lucky I didn't know my pay was already in my account, and I went there with only the money in my purse.. coz I sure nearly emptied my purse haha..
DVDs (pirated of course.. aiyak! And I used to hate buying those, prefering the expensive original ones) were sold at RM4 per cd.. and you got one free if you bought 10. I bought the third season of House as well as Gone Baby Gone, PS I Love You (yeay Ayeen, dapat gak kak Yong tgk!) and a few other CDs. Misa bought Brothers and Sisters as well as the 2nd season of House. I wanted to buy Criminal Minds, Bones, NCIS, CSI, Supernatural and all that.. adeh! Kelabu mate tgk semua tu..
Then there were all sorts of bracelets. Gile tul.. my favourite collection tu! I bought one for me, Izati and Farah. There were all sorts of designs and sold at a very cheap price. Bart geleng kepale tgk Ayu pilih haha..
One shop sold beaded slippers, much to Bart's delight and it was my turn to geleng kepale haha.. and as I waited for her to choose, I came across the fridge magnets, yeay! I'm starting to collect fridge magnets now (Hint! Hint!) and I was delighted to find fridge magnets showing roti canai, satay, char koay teow and nasik ayam.. sgt chumel! Then me and Misa shrieked in delight when we found figurines (betul ke eje ni?) of the Dragon Ball cartoon..
Bart then went in search of a purse, RM20 only maaa hehe.. and me and Misa found these very soft pashminas and bought one each. Huh, bleh pakai time sejuk² dalam bilik nih.. tak pun, buat tudung haha.. but since I'm not the lilit² type, I think I'd stick to using it like a shawl je kot though Bart had already given ideas on how to wear it as a tudung. There were also these pewter coin boxes. Sold at RM38.. and as we walked away the apek kept reducing it. The last price I heard as we went away was RM20 hahaha.. I loved these flower candles.. sgt chumel. Sold for RM30 in a pack of 10 assorted hibiscus, orchids (my fav), roses and bunge² tak dikenali hehe.. They told us, they'd sell it for RM20 if I wanted it and I was about to agree until I saw this 'stuffed frog' looking at me.. geli geleman satu badan. Trus lari dari kedai tu.. yuck!!!! Bart bought this cute handbag.. though Ayu cume boleh mambayangkan je pakai bag camtu hahah.. sungguh tak reti! Tapi serius lawo..
Batik² and all sorts of t-shirts tak yah citer la.. a whole assortment of them, you'd be spoilt for choice. There was this set of Japanese-like utensils to serve small delicate food. Sgt chumel and it would be a great wedding gift.. tp the person didn't wanna sell it for RM35, he stubbornly wanted RM38. Okay la, RM3 pun Ayu nak berkire ke? Well, one thing I've learnt yesterday.. when you don't get the price you want, you feel as if you've lost... and no one likes losing kan? Hahaha.. tp nyesal pun ade coz it would be a nice gift for Huda..
Jewellery boxes were abundant. Pewter? With pressed flowers? Wooden? You name it, you can get it. Rase nak beli jugak for my bracelet collection yg semakin bertambah dah skrg huhu.. but there were so many other things that distracted me heheh.. dah balik baru teringat I wanted the pewter coin box and jewellery box yang ade corak² from sea shells..
Aiiii.. sib baik tatau gaji dah masuk hahah.. The three of us didn't even realize it was nearly 12 as we headed back from the farthest stall (it was a VERY long stretch of stalls) to Bart's car..
Diriku sgt tension skrg.. Uhh, dah le yuran nnt dekat RM3000, terbatuk² rase nak nyimpannye.. pastu pagi Ahad tu, tgk cermin kete retak.. Adeh! Tension nye rase bile tgk retak panjang tu padehal spjg Sabtu tu ade kelas sampai mlm so mmg dok bawak kete and takde pun crack tu.. nak marah pun ade, especially bile budak² ni (bukan budak² la.. more like bapak² budak!) tgk and bgtau sebenarnye point of impact tu mcm gaya kene ketuk je, bukan cam kene batu.. Ohhh, dan Ayu mule membara dia dalam hati!! Watched American Idol yesterday and this was one of the songs. I loved this song dari dulu dah but never caught the lyrics..
Then something happened.. unexpected and unplanned. And a crappy night (as I was expecting during the afternoon since I couldn't stop thinking of the thing that made me tense) turned out into a kinda wonderful one :) And I couldn't stop smiling.. Right through the next day.. ALL DAY long! And right through yesterday too..
Hahah.. lets stop the idiotic musings here..
Well, on Saturday me and a friend went to kak Chah's wedding. I was supposed to go with kak Shima and abg Fazli but since they had planned to meet their friends (kak Chah is from their batch) at the kenduri, I was feeling a bit reluctant to go with them. Luckily, a staff here wanted to go too so I went with him. We arrived a bit late.. okay la, we arrive dramatically late hahah.. with the khemah kenduri already empty and it was only around 2.30pm!!! Hahaha, that's the Perak way for you. Suda malu mau turun kereta but since we had endured a 2 hour and a half drive, we'd better go, right? Heheh.. Anyway, we arrived back in Pt Buntar around 8pm and I was knackered eventhough I didn't drive one bit during the journey hahah.. tak reti bawak kete manual maaa! The next day, I thought of lying down in bed for a while but I just couldn't sleep (Refer to the early part of this entry hahah..). I mean, who sleeps while smiling? Err, ade kot ek org leh wat? Anyway, decided to wake up and go back to Penang and spent a long nice day at home with Mama, Ikram, Izati and Iskandar..
Ok la, gtg! Better start on my paper, dah tangguh byk hari dah ni.. daaa! This is my character in Habbo.com.my. Initially, my character didn't wear a hijab but Ana taught me how to mix and match some clothings and voila! My character is now very demure-looking in her long-sleeved blouse, skirt and hijab heheh.. Hmm, wonder why it looks a bit like the clothes I wore in my previous entries in blogspot huhu..
Heheh.. now this is MORE like what I wore to KL and on my birthday.. except the shoes la! Hehe.. no wonder Mama keeps telling me to change my fav colour. Asyik² blue and pink! Cam dalam dunia ni tadek kaler lain la Ayu ni heheh.. Anyway, Adi asked me to try this out around February, I think, but I had my hands full with Eilma253 (my Neopet hehe..) and I didn't wanna take care of another pet. However, after reading Ana's entry in her Yahoo! blog, I thought I'd give it a try..
Kinda fun jugak.. you can chat with your friends while moving around in the hotel. You can get something to drink from fridges, coffee makers etc.. You can also take a bath (thank you Ana, bg tumpang mandi heheh..) while chatting hahah.. with a choice of bubble baths or just plain water. Then there are these teleports. Ana and Adi both have them for easy access to each other's room. But when I checked, the least expensive was 3 credits.. aiyak! The characters are the best. You can mix and match so many things so you most probably would come up with a character that reflects who you are. Ana's character looked a lot like her, just as Adi's was a mirror image of himself. I dunno how to make mine to look like me hahah.. so excuse the confusion from my character up there to the real me hehe.. So by now, I've already been a Habbo for approximately 27 hours.. bad news is, I already finished RM24 for this thing. Adi says there are easier ways to buy the credits. Gile! I hope I don't get addicted to this like my Neopets or my bill would mostly be for Habbo..
Sheesh! Who says having fun is free?!! Cinta dalam Hati.. and adios to Dgon! Okay.. laugh at me! Haha, I'm not sure if this is an old song ke new song ke but only recently selalu dengar kat Fly. And yes, I DO know Ungu ni lagu dia cam typical, you listen to the beginning of the song and you suda boley tau ini lagu Ungu but say what you want, I'm listening to this song repeatedly sekarang. Kirenye lagu With You sedang sedikit di abaikan buat sementara waktu, thanx to Sharil yang w/pun telah tolong carik kan lagu ni, tp juge telah mengutuk Ayu dengan menyatakan perasaan kasihannye pade Choong and abg Fadzil yang akan terpakse dengar lagu ini berulangkali sampai Ayu boring heheh..
Juge di hari ini, ingin saya nyatekan perasaan sedih saya kerane terpakse berpisah dengan seorang insan yang istimewa dalam hidup saya iaitu salah seorang adik saya dia sini: Nurulhuda Mat Kilau a.k.a Dgon. So we went there and I ate my fav CKT before we headed to Carrefour for I wanted to buy a colour box for my tudungs yang sudah bertambah bilangannye tanpe disedari. After that singgah umah Dgon to solat Isya before going back to my house tp upenye Dgon and Ana dah pakat. diorg kunci pintu and Ana sorokkan kunci.. make Ayu telah di culik oleh Dgon adik beradik dan terpakse bermalam di situ heheh.. dan oleh kerane saya cume ade baju di badan sahaje, terase sgt nasib baik la ade gak baju Dgon yang saya bleh pakai hahaha.. So mlm tu layan movie Conan and citer apetah pasal this boy who can see ghosts and then memasing tertido. Oppp, lupe plak. 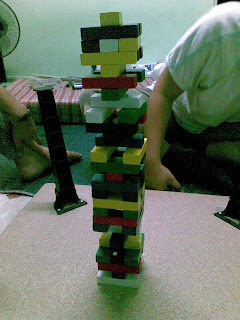 juge telah men this Jenga-like game heheh.. dengan sgt bising nye! Next morning, siap² and had breakfast of crisps (haha..!) before going back. Mase bye Dgon, tak rase ape pun.. but as the car moved on, tetibe terase air mate nak jatuh.. adeh! Truth is, I kinda miss this girl already.. Dah takde dah tempat nak singgah² klau gi area Sbrg Jaya dah pasni. Nak solat pun kene gi masjid la pasni.. Mane nak sangke bleh baik ngan dia. She was one of my juniors yang saya sangat takut sbb muke dia sgt serius klau ngan orang yang dia tak kenal. Then she kept going with me for my data collection so baru la dapat kenal dia. Bukan hari Jumaat tu je kene kidnap ngan dia, when she stayed in the hostel pun byk kali jek kene kidnap heheh..
..and once upon a time ago, she was the only one who cared to listen. Orang lain tak peduli pun, cume suke was speculation sendiri without any care of my humiliation. I don't expect her to understand, but she cared enough to listen to me and was the only one brave enough to tell me that I was sad. I remember breaking down in front of her when she told me this, after I was too tired to pretend I didn't notice anything happening. And another thing I appreciate about her is, she NEVER takes any sides. Even when she listened to me, I knew, she didn't want to take sides but she'd always remind me of the good things. Maybe sebab dia sendiri kene with her friend ke ape ke but I still appreciate it.. thank you Dgon! Adeh! Sudah rase sedih balik.. on Thursday she bought me a kain for baju kurung haha.. byk meno la pulak baju kurung Ayu tahun ni! Tak tau la bile plak boleh jumpe dia..
Just so my blog tak berabuk.. Anyway, on Monday I got a birthday present from my junior who's doing his PhD in Japan. Hehe, ingt dia nak anto kad jek, upenye anto adiah sekali. My gift tu plak abg Joe trus letak atas meja so by the time I arrived at school, dah ada audience. Nak tanak, kene la bukak depan diorg and the first thing yg kuar is this Tupperware-like container. Puga dah excited, ingatkan makanan from Japan. Bile bukak, guess what?!?! Uik.. mende budak ni. Citt, mentang² dia tau kak Ayu dia tak pandai gune handbag, itu yg dibagi nye.. dan Ayu terpinga² memikirkan, camne la nak gune mende alah ni hahah.. Anyway, byk² thanx! Beg tu chumel.. and dah gune pun time gi KL aritu hahah.. much to the amusement of my friends yang baru 1st time tgk Ayu pakai handbag!!! Gi KL aritu lak, hmm.. ok la. Cume sedikit bosan haha.. usually if going to KL, I'd always be the chosen driver. 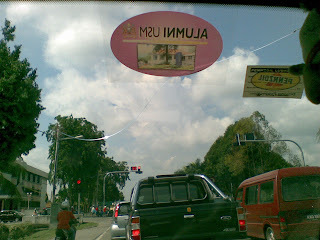 This time, we had to take the USM bus and mule la Ayu tak senang duduk 4 jam. Nak tido, sgt tak selese.. then since Maxis has been giving out the free sms, my sister had be frowarding giler byk nye sms.. so I sat in the bus and chose a few yang menyentuh sanubariku (Echeeeewaaahhh!! Hahah..) to forward plak kat org.. w/pun Ayu tak dpt sms free hehe.. The exhibition pun sgt boring! Okay la, tipu, ade la sedikit menarik. And me as someone who did my masters on signalized intersection ade gak la belajar bende baru yg tidak pernah ku sangke hahah.. sungguh malu! Then we went to Putrajaya and solat there where an embarassing incident happened yang tidak mahu ku ceritekan di sini kerane perasaan malu masih menebal haha.. Okay la.. suda mau pulang. I thought this was gonna be a longer entry tp suda kene writer's block la pulak..
Penat smlm tak ilang lagi..
Then photostat 6 more assignments (tu pun sib baik the best 3 dah photocopy awal²).. OBE nye pasal le ni..
Then discuss with Dr Farhan on the new paper, my previous paper and my research report..
Then gi Bagan Serai (nape la bg check utk Public Bank Bagan Serai wahai cikgu Arun oiiiiii..) beratur dlm bank to cash in my cheque..
Makan pun just grab a burger from KFC beside Public Bank..
Balik school, someone was waiting for me in front of the postgraduate room..
And what he did, made me smile..